Energy security and legal compliance are the US Navy Energy Program’s missions. GIS provides streamlined data for better decisions for potential savings on energy. US Navy Energy Program’s new ArcGIS dashboard increases data credibility. Energy awareness is becoming a major focus for the United States federal government as both costs and demand rise. Budget constraints across the military services put further emphasis on the need to secure the nation’s energy supplies and create federally mandated programs. The Navy Shore Geospatial Energy Module (NSGEM) dashboard provides a bread crumb tracker and date picker to drill down to the geographic extent and lens for specific charts and reports. The map viewer renders buildings according to benchmark score, and the Data Quality Score highlights the accuracy and completeness of the information behind the dashboard. The United States Navy department known as CNIC (Commander, Navy Installation Command) has responded by creating the CNIC Energy Program, which was developed to provide guidance, policy, and tools for implementing broad-based energy reduction and sustainability practices within the navy—everything from replacing old windows and installing new heating systems to installing smart meters on buildings and seeking out and utilizing renewable and alternative sources, like wind turbines and solar panels. The goals of the program are to achieve by 2020 a 50 percent reduction in energy consumption and be at 50 percent usage of renewable energy. To meet these goals in part and reduce energy demands across installations, CNIC has adopted a facility energy strategy that consists of innovation, expansion, and awareness. As the program expands, energy usage will become highly visible and the culture will change. Advancing new technologies is key to the program’s goals of streamlining the capture of data, leveraging business systems that contain energy consumption information, and combining them to create powerful tools for the program managers. The program aims to provide a means of measurement and verification and, most importantly, the knowledge base to make more informed decisions. The CNIC HQ Energy Program manager, Sandrine Schultz, had a vision of an overarching geospatial tool that would provide the navy with centralized information access for tracking, measuring, and planning energy usage to meet the program’s goals. Previously, there was no effective way of visualizing and displaying the important tabular data in the business systems that tracked energy usage. Schultz knew that Esri Platinum Partner Geographic Information Services, Inc. (GISi), of Birmingham, Alabama, was already supporting the Naval Facilities Engineering Command’s GeoReadiness Explorer (GRX) enterprise map viewer application, which contained worldwide geospatial data and services for business lines across the navy. Thus, she contracted GISi to review the navy’s current energy appraisable capabilities and build an energy dashboard within GRX. This was possible because GRX is constructed on a .NET Framework using Adobe Flex, ArcGIS API for Flex, and ArcGIS for Server. This geospatial energy analysis solution would leverage that existing framework and ultimately become the Navy Shore Geospatial Energy Module (NSGEM). As the NSGEM team started development, the data sources were gathered and compared. Initial benchmark scores were calculated for energy consumption and goals for reduction set. This in turn established the baseline metrics needed to go forward with the program’s mission. A gap analysis was performed initially to identify disparities between the main data sources: the navy’s real-property database, the utility allocation and billing system, and the GeoReadiness worldwide geospatial data. This effort pinpointed further needs and issues and generated the data quality score shown in the current interface. Data validation and correction are key components, and one of the most challenging aspects, to providing NSGEM functionality. 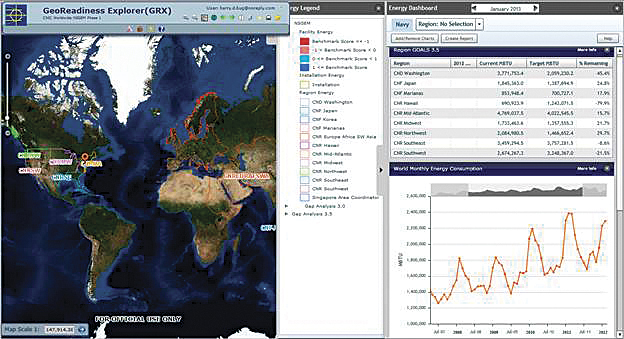 The GRX World Lens provides information for each region's energy consumption and its progress toward overall reduction. In the view above, the World Monthly Energy Consumption chart is shown with the scrolling function that enables the user to see consumption trends over time. Processes were then built to extract, transform, and load the tabular data from the business systems into spatial data that is then published through ArcGIS for Server as a map service. The published map service contains layers depicting energy consumption and reduction efforts at the regional, installation, and facility levels. The map publishing process is done via a customized in-house web application called map publisher. The GRX map viewer is the front end of the system, and while the bulk of the NSGEM functionality revolves around the dashboard and various tables and charts, it does leverage this existing map viewer base to display and navigate to spatial data. Upon the initial release of NSGEM in November 2012, it became apparent that myriad individuals throughout the navy echelons have a stake in its functionality and future, with each echelon requiring different reporting and analysis needs. One measure taken to support headquarters was the creation of regional energy map books (REMBs). ArcGIS and customized Python scripting were leveraged in an automation process for map book creation that employs the NSGEM data. These automated processes provide high-level, quality cartographic outputs for the leadership at CNIC and the Naval Facilities Engineering Command to be able to view statistics and consumption information in PDF format for which users do not have to access a separate application. While the primary functions of NSGEM and the REMBs are heightened awareness and easier accessibility of energy consumption information, Schultz says the overarching end goal is to increase data credibility while identifying potential savings on energy consumption. NSGEM provides the energy program with a one-stop shop for viewing and using energy consumption data to make more informed decisions. 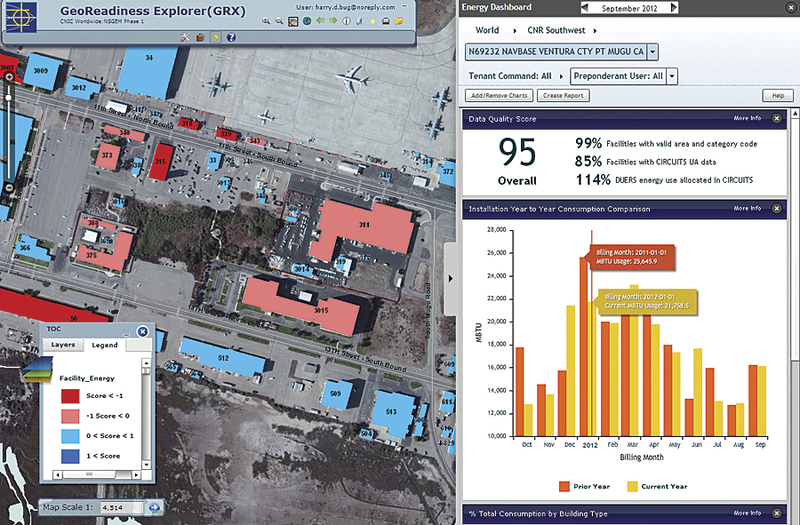 CNIC and the Naval Facilities Engineering Command now have the ability to reveal the story of data that has been trapped in a business system and to smoothly and dynamically transition across all necessary temporal (many years), spatial (zoom in/zoom out), and organizational (world, regional, installation, and facility) scales. NSGEM is geospatially enabling the energy program with tools to track and measure its progress toward meeting reduction goals, pinpoint specific areas for improvements or restorations, view new and alternative energy sources geospatially, create sustainable practices, and increase overall energy usage awareness. “Geospatial capabilities are changing the way that we all do business. We turned data into decisions,” says Schultz. Amy Hrdlicka, GISP, is a senior GIS analyst at GISi. She provides contract support to the US Navy, with a focus on facilities, asset management, and emergency response GIS solutions. She can be reached at ahrdlicka@gisinc.com. For more information, contact Sandrine Schultz, CNIC HQ Energy Program manager.